If you want to make your business more successful & improve your engagement with your clients, then you should try voice broadcasting service for your business. It is an easy to use & cost-effective way to grow your business. 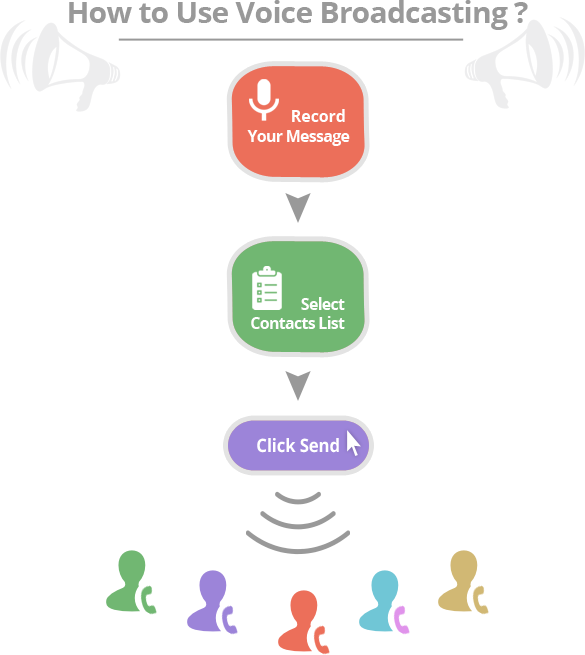 With voice broadcasting, you can deliver recorded message out to customers, prospects, or vendors. In voice broadcast, firstly you need to record a message that you want to deliver. Select the contacts list of potential customers or users that you want to deliver that voice message. Then, you can send this message or you can schedule that message. Voice broadcasting system will deliver your message to customers or users. It is an effective marketing tool because your personalized message is delivered to target audiences. It is extremely fast, your message will be delivered instantly & accurately. It will surely improve your business productivity. It is very easy to use service, you simply record your message; choose contact list & send. Your message will be delivered to thousands of people. So, it is very easy way to grow your business. It is a marketing method to reach your targeted audiences. So, it is an effective way to generate sales. It is cost-effective way to tell about your products or services to multiple customers. It keeps customers happy because they are getting what they have been looking for. So, business ROI will be higher. Voice broadcasting is a great medium to reach thousands of people with your message. People will know about your services & your brand. So, it is a very good platform to improve your brand presence & reputation in market. Voice broadcasting is an essential business tool for any organizations or industry which wants to engage with more customers, grow business, and generate more revenues. Here are some industries which deliver voice broadcasting campaigns frequently. Voice message delivers to millions of people. So, political parties also choose this service to educate people about their campaign & candidates. Callers send their message to people & ask people for voting on election day. It is the best way to tell who is candidate & what he stands for. Your business can’t grow & generate revenues if potential customers don’t know about you. By advertising campaigns, your business get noticed. You can create voice campaigns for offers, promotions or services you offer & how it will be benefit. Financial companies need new leads to generate business. With voice broadcasting, you can get more potential leads. You can also ask people to press a number on their keypad & you will know more about their interest. Voice broadcasting is an effective & smart way to engage with your customers. It can be beneficial marketing method if you used it correctly. It is also used for alerts, event promotions, delivery confirmations & surveys.